Windows 10 Technical Preview Build 9841 includes Internet Explorer 11.00.9841.0. Given that it is preview software, my initial thoughts are that the browser seems remarkably stable. 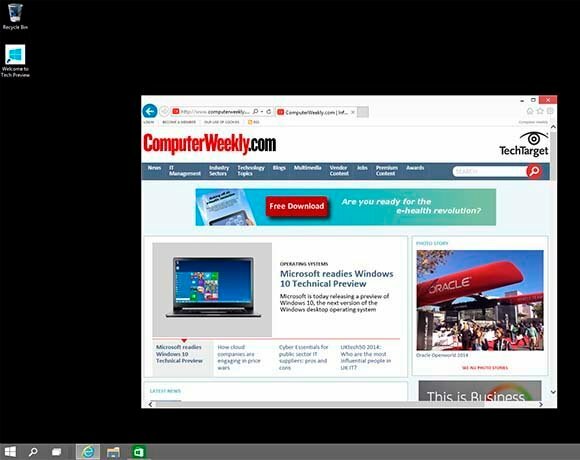 Here is a screenshot of the browser rendering the Computer Weekly website. I've only booted up Windows 10 Technical Preview a few times so far. As a die-hard Windows 7 user, the user experience is quite similar, but with some of the somewhat better elements of Windows 8 - like OneDrive. It is nice to see that in this release Microsoft has included a couple of useful third-party apps such as DropBox, so you aren't restricted to OneDrve for cloud storage. While it is only a preview release, the PC settings option is still not linked to Control Panel, which is something that annoyed me with Windows 8 because the user isn't quite sure where to go and unlike Windows 7, Control Panel isn't directly available from the Start menu. But that's a minor point. My initial thoughts are: "If you are a Windows 7 user, yes, download it and try out Windows 10 Technical Preview." From a hardware perspective, Windows 10 Technical Preview seems to have a small footprint, taking about 10 Gbytes of space on the VMware player virtual disc. Given that I configured the VM to use 8 GB of memory, performance is certainly acceptable on my workstation PC which uses an AMD FX- 6100 3.3 GHz 6-core CPU with 16 GB memory and Nvidia GTX 570 GPU running Windows 7 Ultimate as the host OS.